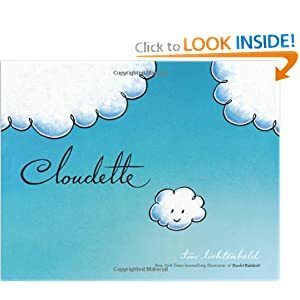 Our book for today was Cloudette by Tom Lichtenheld. It is a sweet book about a small cloud that sees all the big clouds doing important things. Cloudette finds that she can do something important even though she is small. I love books like this because we have a huge age difference with our 4 kids (the oldest is 17 and the youngest is 4). I like to take the opportunity to encourage the younger children that they have an important role in our family! After we read our book, I let Aubrey play with "clouds". I just squirted some shaving cream on a cookie sheet and let her play with it. I think it is so important to provide some activities that have no end product...just pure child-directed fun! She loved playing with the shaving cream...and she smelled great when she was done!